account you will be able to schedule your driving lessons. After scheduling a driving lesson you will receive an email confirmation. You will also receive an email reminder before your lesson. your grade and a review of your lesson. Driving Lessons are released throughout the month. If the calendar is full, please check back often for new openings. *We make every effort to place your student with the instructor you select, however, there are occasions when your student may need to be moved to another instructor. Tuesday-Saturday cancel 24 hours in advance. Sunday, Monday and Holidays must be cancelled by 3:00 pm on the previous Friday. Failure to cancel in advance will result in a $25.00 late cancellation penalty. 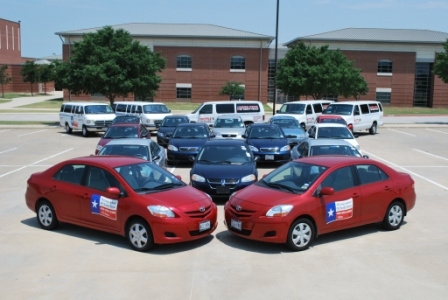 Teens must have a valid Texas Learners License to enroll. Texas Teen driver education in-car requirements are 7 hours Behind the Wheel & 7 hours Observation. To enroll simply click the “Enroll Now” link and select a location. Next, complete the on-line enrollment form and submit. Payment must be made in full at time of enrollment. You will receive an email within 24 business hours with your user ID and password information for the drive time reservation system.